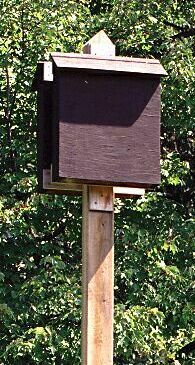 Big Brown Bats are the most likely species to use bat boxes in our local area. North American bats consume half their weight in flying insects each day and Little Brown Bats can consume 600 mosquitoes in a single hour. Tropical bats are the key pollinators of such important food plants such as bananas, mangoes, breadfruit, dates, avocados and figs. At one time health risks were associated with bats but histoplasmosis has never been found in Canadian bat colonies. Bats do occassionally get rabies, but less frequently than foxes or skunks. The bat symbol in China represents good luck and happiness. Certainly the beneficial qualities of bats have improved their image in recent years. Bat populations have fallen in North America. Pesticide use, toxic chemicals in house timbers, human disturbance, loss of natural roost sites, loss of habitat, decline in insect prey and new building construction methods (which eliminate potential roost sites) may have contributed to this decline. Some of the large roosts in the United States have fallen over 90% in the past 30 years. The bats lost from just the two largest roosts would have consumed 600,000 lb of insects each night. Twenty-one species of bats are known from Canada of which eight have been recorded in our local county. Only two species are common, Big Brown Bat and Red Bat. Big Brown Bats are common in both urban and rural areas, especially around lights which attract their insect prey (especially June Beetles). 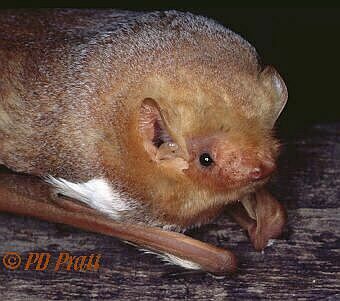 Red Bats prefer woodlands but also like to hunt moths and other insects around lights. This common Ontario bat is seldom encountered in our region due to the lack of suitable caves for hibernation. 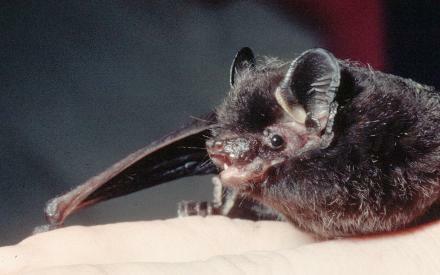 Unlike most small birds and other small mammals, bats are long lived. An Ontario Little Brown Bat lived over 31 years in the wild. This woodland species has been recorded once at Point Pelee. In recent years a few Pipistrelles have been found at the tip of Point Pelee in May and October. These small bats can be identified by their tri-coloured fur and pale forearms. Silver-haired, Red and Hoary Bats do not hibernate in Ontario but migrate south for the winter. This handsome bat is most often seen in the autumn along the north shore of Lake Erie. There are a few winter records for Silver-haired Bat in Essex County but they are normally absent during the summer. Big Browns are the most widespread and common bat in our area. 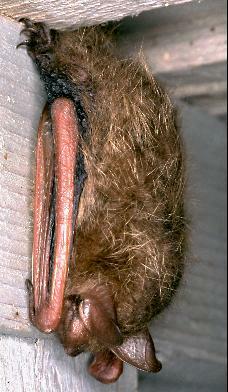 This species and the Little Brown Bat are the only bats which regularly use buildings for roosts and nurseries. The Big Brown will also uses buildings for hibernation. There is an old record from 1911 at Point Pelee National Park. This is the sole occurrence for Canada. 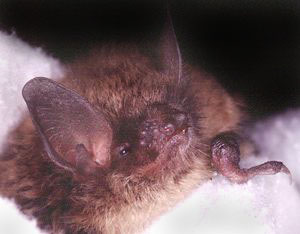 Red Bat is the most common woodland bat in Essex County. On November 12, 2008 there were 26 counted flying over the road to the tip of Point Pelee at dusk. This is one of our most beautiful bats. Males are bright brick red with prominent creamy shoulder flashes. Females are similar but less brightly coloured. This species does not enter buildings and roosts in the foliage of mature trees. During migration, nights are often cool with little insect activity. At these times Red Bats are sometimes seen feeding in the daytime. The wing and tail membranes are used to scoop up their prey. This is our largest bat with a wingspan of 38-41 cm. (16 in.). The large size, "hoary" pelage and pale ears rimmed in black make it easy to identify. Males and females summer in separate areas with only females occuring in our region. They are present in small numbers during summer but most records are of migrating individuals in the fall. Dewer, H.J., C.L. Furlonger and M.B. Fenton. 1985. A survey of bats of the Carolinian Zone of Ontario. World Wildlife Fund, unpubl. report, 23 pp. Fenton, M.B. 1983. Just Bats. University of Toronto Press. Toronto. 165 pp. Tuttle, M.D. 1988. America's Neighborhood Bats. University of Texas Press. Austin. 96 pp. Copyright � 2003-2008. All rights reserved. You are on a City of Windsor Web Site.